First I have to admit that lately my eyes have been wandering…over to my friend’s iPhone, then to his iPad. Don’t get me wrong, I love my Blackberry, but Apple has been killing it with some slick-looking devices for several years now and a man can only resist so long. But I think the new Blackberry Playbook might have what it takes to keep me happily married to my Blackberry Tour for a couple more years yet! Bluetooth Tethering: Probably the most ultra-cool feature of the Playbook is its ability to tether via Bluetooth to your cellphone to get wireless internet. It will support 3G speeds, but probably not 4G speeds. However, if tethering is allowed via WiFi then you can get 4G speeds. The Bluetooth tether feature is obviously much better than the iPad’s general requirement of a data plan. If you already have the iPad and a Blackberry then you can tether them using these instructions…just be prepared to pay for a couple specialized programs and hack the crap out of your devices. 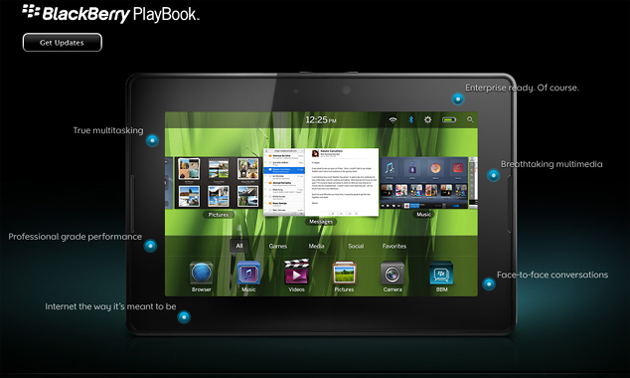 Flash: browse any website with the Playbook. This only applies when the PB is vs the iPad, other Android or Win7 tabs don’t have the same limitation as Apple’s product. Rotation: doesn’t support rotation yet. Apps will probably be written for it initially which are either in portrait or landscape mode, but it will take a software upgrade to bring rotation to the Playbook. Or, worse yet, they may not have it on the first gen Playbook at all. SD Card Reader: None, but you can access apps on a Blackberry SD card via the Bluetooth tether. USB Ports: Playbook probably won’t support USB host mode (it will have microUSB only) so you will not be able to use USB keys or similar devices on it. No word on whether it will be implemented in the future or not. I want RIM to start talking and showing apps and stop showing that whale video, does 1080p really matter on 7″ device or mean anything in the business world? Only WiFi or Bluetooth tethering to Blackberry for internet, no cellular: I put this in the neutral section because it won’t affect me, but the truth is, this could be a CON for alot of people who like how the PB looks, but are not Blackberry users yet and don’t use a WiFi cellular hotspot like MiFi. There are rumors of a 3G and 4G version, but don’t expect those real soon. Also, the WiFi tethering is purely theoretical at this time and only supported by phones that can create an access point (which would look like a WiFi hotspot to the PB). Don’t expect to get sync of your BB contacts, email, etc to the PB when connected via hotspot to another device. The way things look to me right now, the PB will be an extension of your BB and not a standalone device so it won’t be able to authenticate with your BES or Exchange. But someone will likely write a program to allow connection to Exchange directly for sync bypassing the BES (there’s a can of worms right there). Syncs with your BB: Much speculation has gone into the sync feature. It would make sense for sync to be via an application that doesn’t store any info on the PB so there’s no security risk once the PB is separated from its BB. This also means that if your BB is not charged or not near your PB you probably will have to use other programs/services to access your contacts, email, etc via the internet. Enterprise apps will likely not be accessible at all unless your BB is working and paired. Probably a neutral issue for most BB users, but I will wait for the official word on pairing before I commit this one to the CON section. Touch sensitive bezel: Not sure if having touch on the bezel is a good idea. Can’t help but think that since it’s only 7″ form factor your fingers will brush things you don’t want to accidentally. Neutral rating because you’ll probably learn to avoid it after you learn the device. There you have it…some observations on the new Blackberry Playbook tablet. Please note that all this information is only current as of 12-19-2010 and things will likely change before it is released. Please drop me a line below and let me know if you intend to purchase one or if you have found a tablet that is even better than the Playbook!